You all know how much I love my Baggu bags. Well, those wonderful Baggu people have come out with another must have item, the Baggu Zips. 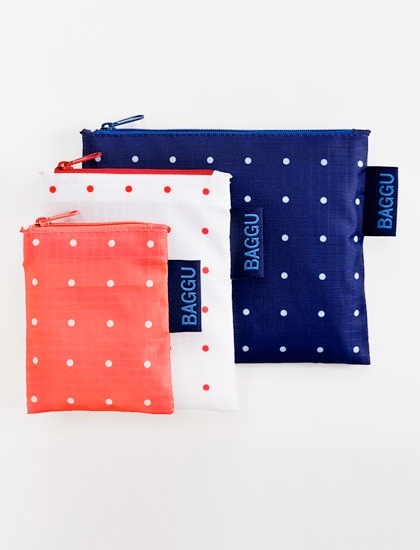 These adorable little zippered pouches are made out of the same ripstop nylon as the original bags and come in a plethora of colors and prints. (I’m pretty partial to the dots myself.) And are perfect to organize the detritus of our lives. They range in size from 3.25” x 4” to 12” x 15” so you can bag everything from earbuds, toiletries, cords and chargers to shoes, art supplies, or even a hairdryer. I suggest you pick some up soon, they’d make great stocking stuffers! « Make your voice heard.